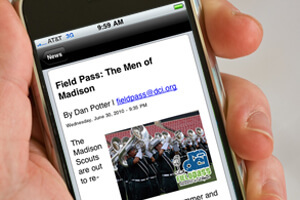 New for Summer 2010: The DCI iPhone app! In today's Field Pass presented by Zildjian, Dan Potter talks with IT Director Ricky Fritzsching and app designer Daniel Ferland about the newest way to follow Marching Music's Major League anytime, anywhere. Learn more about the DCI iPhone app.